LouMontana added a comment to T62264: When changing to automatic sometimes mag disappears & cocking handle goes through gun..
LouMontana added a comment to T126651: Second lowest Stance bug. LouMontana added a comment to T120109: limping animations errors. LouMontana added a comment to T127948: [RC] Tanks DLC - MGS turning out/in quickly sets the camera in the armored body. LouMontana added a comment to T127986: RC 1.82 - Warning Message: No entry 'bin\config.bin/RadioProtocolENG.SentKeepDistance'. Tested right now with the RC and it didn't happen. …I didn't find the upload button at first. Here it is! Just to make sure about the severity of the problem, as soon as you "properly" turn in (wait until the end of the animation) then turn out, everything is back to normal. the problem occurs when you turn in >then< before the anim is done, turn out. LouMontana added a comment to T123456: child task will not close out when parent succeeds..
my comment was valid when posted and was concerning Arma 2. It seems this behaviour changed in Arma 3, I then invite you to add your note. it happened in the devBranch before the RC as well as in the RC, I need to re d/l the current devBranch to check. LouMontana edited Steps To Reproduce on T127948: [RC] Tanks DLC - MGS turning out/in quickly sets the camera in the armored body. LouMontana renamed T127948: [RC] Tanks DLC - MGS turning out/in quickly sets the camera in the armored body from Tanks DLC - MGS turning out/in quickly sets the camera in the armored body to [RC] Tanks DLC - MGS turning out/in quickly sets the camera in the armored body. LouMontana created T127948: [RC] Tanks DLC - MGS turning out/in quickly sets the camera in the armored body. Even going back or diagonal gets you back to prone iirc. Thanks for the report! LouMontana added a comment to T126528: "zasleh" muzzle flash graphic error (simple object) in IDAP campaign. LouMontana renamed T126528: "zasleh" muzzle flash graphic error (simple object) in IDAP campaign from "zasleh" muzzle flash graphic error (simple object) to "zasleh" muzzle flash graphic error (simple object) in IDAP campaign. LouMontana updated the task description for T126528: "zasleh" muzzle flash graphic error (simple object) in IDAP campaign. LouMontana created T126528: "zasleh" muzzle flash graphic error (simple object) in IDAP campaign. Inventory issue still present in 1.72.142223 . Nothing else to report! 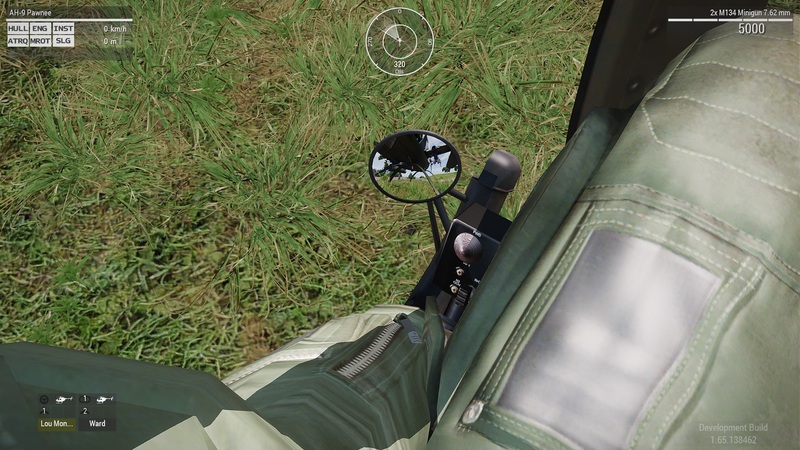 LouMontana added a comment to T69030: Mirrors at almost any vehicle reflect environment incorrectly. may I add the MH6? The reflection is *not* mirrored. ^ this is more like the mirror is a screen showing the recorded helicopter... the body of the helicopter should appear on the right, not the left. LouMontana updated the task description for T120109: limping animations errors. All the issues can be found in v1.65.138345, I edit the bug description. LouMontana added a comment to T70440: TeamSwitch interface - disable it by default. I should add that in version 1.65.138309, setting enableTeamSwitch = 0 (or false) in description.ext doesn't forbid TeamSwitch. LouMontana added a comment to T77716: Arma3's UPnP seems not to work. I think the issue you describe here may be related to the beta issue #2. It should be reproducible with player controlled soldiers. LouMontana edited Steps To Reproduce on T120109: limping animations errors. LouMontana added a comment to T120063: Still Missing some define variable in arma 3.... Command ctrlCreate. things here are not immediate, you may want to wait some time before upping. LouMontana created T120109: limping animations errors. LouMontana added a comment to T76002: Effect of lameness. Can this ticket be considered Done? LouMontana added a comment to T60186: You should be able to move while changing weapons. LouMontana added a comment to T80081: Character keeps walking for a bit when lowering the weapon while walking. What makes it hard to fix this? Is the animation itself flawed and would require new mocaping? LouMontana added a comment to T79712: Rotorlib helicopters explode when engineOn true; command is used (DEV 127928). LouMontana added a comment to T78741: BLUFOR Pilot missing in editor..
LouMontana added a comment to T76218: lean left handgun walk animation error : rifle not following the unit. I have to go against your statement as I encounter it 100% times in vanilla. note that the rifle on your back stays where it is while you go forward. please give it another try, and give me the feedback? seems fixed in 1.43dev (maybe even in 1.42) !! still present in 1.30, 1.32, 1.33.127735...! aaand in 1.41.129399 as well. still present in 1.20 =( any news on it? LouMontana edited Steps To Reproduce on T76218: lean left handgun walk animation error : rifle not following the unit. LouMontana added a comment to T75936: Swimming is broken once again!. tested right now in the editor, same issue here. setPos'ing over the water is giving wrong animation, even after game init. press "F" to switch weapon mode and you will see the game will think the soldier has scuba suit and fins. player switchMove "" will do the trick. LouMontana added a comment to T73496: Compass Position. Wow. Just wow. I'll downvote. My reason? Your manners. End of discussion. LouMontana added a comment to T73330: Claymore and C4 should detonate when hit bullets. @tyler2, you keep on showing videos of the game /not doing what you want/ instead of providing links that /reality is not present in the game/. I agree after some huge explosives nearby the C4 should be "deleted" (aka not working anymore), but it should not trigger "just like this" just because *you want*. TeamSwitch is still the default option, am I only one of the few to believe it should be changed the other way? same behaviour in 1.42, without setAccTime. I don't think you want to be able to play (by default) every role in a 10-soldiers squad, or being able to switch to enemy side ; to me TeamSwitch is the second option and should be declared by the mission designer, not be the default behaviour. I don't think it is ; you play more MP missions in SP (in coop or versus, aka multiple sides) than you play coop where you want teamSwitch activated. I don't think teamSwitch is the option people chose first. LouMontana edited Steps To Reproduce on T70440: TeamSwitch interface - disable it by default. LouMontana added a comment to T70439: TeamSwitch interface - disable it when only one unit is playable. I noticed (in EXE rev. 08432 at least) that it is impossible to switch to another unit when you are dead if there is only one unit left. resolved in EXE rev. 08339 ! LouMontana edited Steps To Reproduce on T70439: TeamSwitch interface - disable it when only one unit is playable. LouMontana added a comment to T70356: Player still drowns after reaching the water surface..
"proper" body position will be detected to the surface and your guy will be - finally - breathing. LouMontana added a comment to T70299: SUGGESTION for new Visual Screen Effects when Injured. LouMontana added a comment to T69602: MP params (paramsArray) rounding values - no more decimals allowed. I am insisting on this one as this is restricting (or making other operations to make it possible for) possible values. LouMontana edited Steps To Reproduce on T69602: MP params (paramsArray) rounding values - no more decimals allowed. LouMontana added a comment to T67685: No local AI Firing anims and visuals not seen after AI reload having used their 1st magazine. LouMontana added a comment to T65741: Add volumetric light. LouMontana added a comment to T64124: Custom faces are not satisfactory..
upvoted .. .. .. ? LouMontana added a comment to T62547: Light sources (except sun and moon) shine their light through objects / do not cast shadows. wait for the end of the reload animation, then press "F" again to come back to the semi firing mode. the magazine will be removed and the cocking handle will be far back, in semi only. press "F" to go to auto and it will be back to normal! this is Arma 3 feedback site not DayZ SA...? LouMontana added a comment to T59473: Helicopters cant taxi. you can get this with keys, RCtrl+L IIRC - it's up to you to reassign though. LouMontana added a comment to T59045: Ocean floor is clearly visible from just beneath the water surface..